My hubby has been waiting patiently for me to spend some time taking photos of the handmade silver jewelry and lapidary work that he sells on his Etsy site (http://andyhight.etsy.com). So last weekend, we watched a few YouTube videos on how to set up an inexpensive home studio and we put something together on the dining room table. We bought a florescent light fixture that had a square white acrylic cover, and Andy wired it to take a wall plug. We bought two inexpensive shop light fixtures on clamps, and Andy rigged up some wooden stands to attach lights to, so we could move them up, down and around. We bought some white foamboard, some white fabric to use as diffusers, and we put together a little bracket strung with fishing line to hang earrings on. Of course we mounted the camera on the tripod and used a cable release. I shot all the jewelry with the Nikon D5000 and the 18-55mm kit lens. 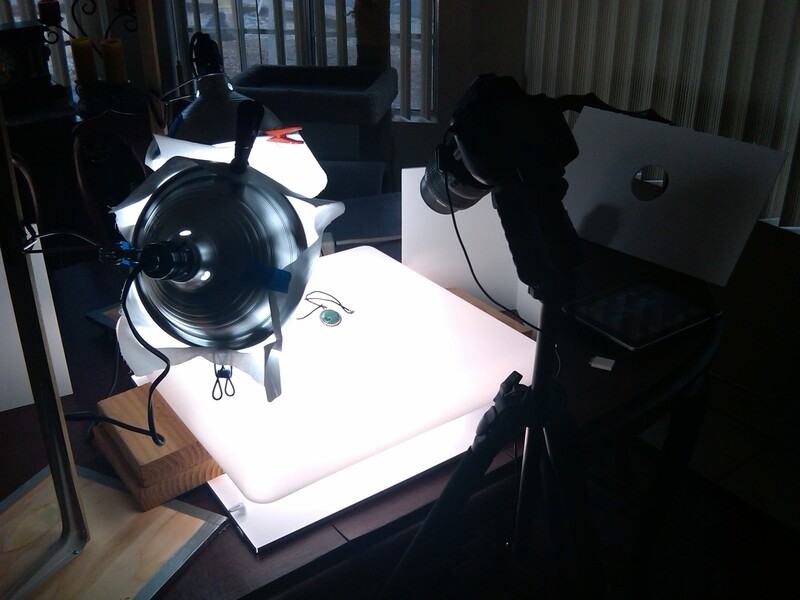 I don’t own a macro lens, but I’m strongly considering renting one for the next time we shoot jewelry. (Note: The photos of the studio setup were taken with my Blackberry–not too bad, really!). We spent about five hours experimenting and shooting, and I’ve started processing some of the shots for website already. 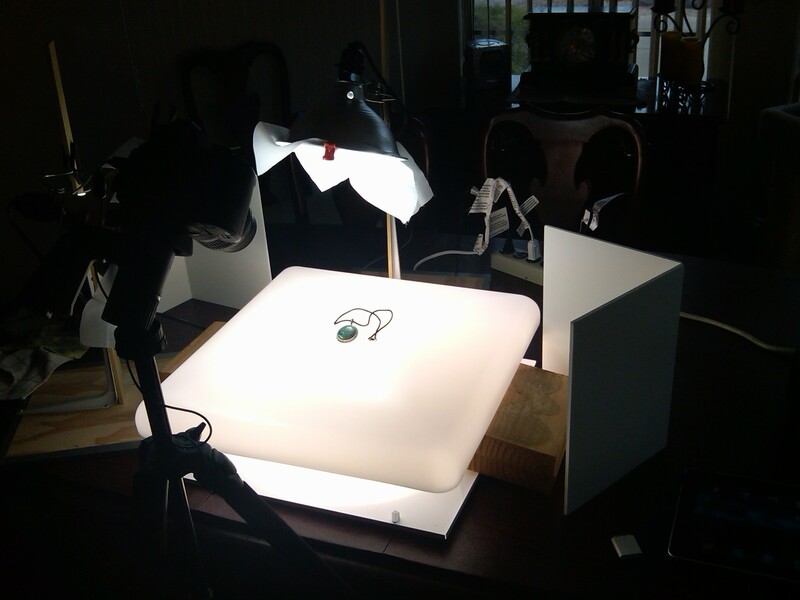 The trickiest part is getting the color corrected so that the color of the stones is as accurate as possible. When these things are listed as sale items, we can’t afford to get all creative with the color–they need to match the real thing. We found a lot of things that we’ll change–in fact, we’ve already purchased a couple sheets of acrylic (translucent white and opaque black) to replace the light fixture acrylic which wasn’t opaque enough. But all in all, we got some images that are much better than the ones he had been using on his site. This entry was posted in Equipment, Learning, Shooting and tagged Arizona, AZ, camera, D5000, home, inexpensive, jewelry, Nikon, photography, studio, tripod. Bookmark the permalink. Zann, you might want to look in to getting an X-Rite ColorChecker Passport. It will help you correct the color balance during post processing. It together with a Pantone HueyPro colormeter are on my wish list at B&H, or alternatively an X-Rite ColorMunki, but that’s a bigger ticket item.